For George accommodation on the Garden Route that has every luxury and service at hand, Fancourt Hotel & Country Club is a superb choice. This George accommodation features 135 luxury rooms as well as Manor House Bedroom suites. Guests can stay in the Fancourt Hotel or Manor House rooms with the finest furnishings and décor. 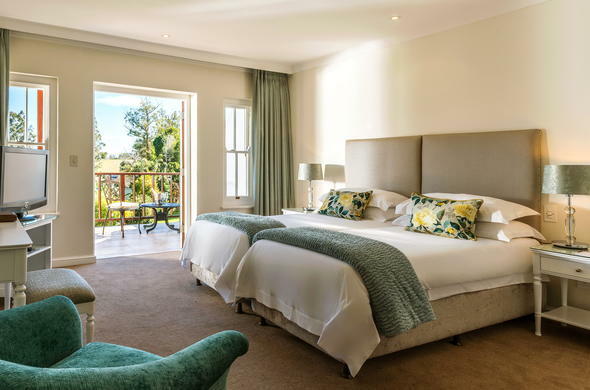 Fancourt offers a mix of contemporary luxury and Old World charm in George accommodation. The Manor House, a National Monument has been beautifully restored and is set in wooded parkland. Room facilities and services include room service, satellite TV, wireless internet, mini-bar and valet service.